We could be fancy and call this insalata di finocchio e pere. But it tastes just as good in English. The subtle anise flavor of fennel plays well with the crisp sweetness of pears. Add a garnish of blue cheese (we favor Gorgonzola) or maybe Parmigiano Reggiano, and you’ve got a springtime starter that will awaken your taste buds from their long winter’s nap. So yeah, we love finocchio (no Pinocchios). Which variety of pear to use for this salad? In the springtime, Bosc pears work well (and their firm texture is great for salads). At other times of the year, just use whatever variety is in season and looks good. We generally prepare the fennel a few hours before serving this salad, and often mix the vinaigrette ahead of time, too. The pears, though, we peel and slice right before serving so they don’t discolor (see Notes). Total prep and assembly time for this dish is about 15 minutes. This recipe serves 4 as a first course. When ready to assemble the salad, place the sliced fennel in a medium-sized mixing bowl. Wash the pears, peel them, then cut them into quarters. Cut away the woody core. Cut the pear quarters into thin slices (or match sticks, if you prefer). Add the pear slices to the mixing bowl. Wash and dry the parsley, then chop it roughly. Add the chopped parsley to the bowl. Add the vinaigrette, then mix the ingredients together thoroughly. Taste, then adjust the seasoning if necessary. Divide the salad among individual serving plates. Cut or crumble the cheese into chunks, then scatter the chunks over the salad plates. Serve and enjoy. Want additional garnish? Try toasted walnuts. Toast about two of ounces of walnut pieces in a dry frying pan over medium-low stovetop heat for a few minutes until they’re fragrant. Cool the walnuts, then scatter them over the salads before serving. You could probably use some of the green fennel fronds for garnish, too. We think the dressing for this salad benefits from a hint of sweetness, which is why we recommend using honey or maple syrup. But balsamic vinegar is already sweet, so if you’re using that instead of white wine vinegar or lemon juice, just omit the sweetener. Use good-quality extra-virgin olive oil in the vinaigrette. Better-quality olive oil really does make a difference. Once you cut into pears, they begin to oxidize and turn brown. That’s why we slice them right before serving. If you want to slice the pears ahead of time, store them in a solution of 50% water and 50% lemon juice or vinegar to slow down oxidation. Pears typically are picked when they’re mature, but not fully ripe. They ripen at room temperature though, so the ones you find at your supermarket may already have reached peak ripeness by the time you buy them. Ask the produce people if you need help selecting ripe pears. Most supermarkets stock several varieties of pears. Bartlett pears are probably the most common (their peak season is from September through January or February). Anjou pears are in season from September through May. Bosc pear season runs from September through April. We use kosher salt in cooking. It’s less salty by volume than regular table salt (the crystals are larger, so they pack a measure less densely). If using regular table salt, start with about half as much as we suggest. But always season to your taste, not ours. “So now it’s French?” I said. “I guess their figures are a bit bulbous,” I said. “Ironic for such healthy foods,” said Mrs K R.
“They won’t make me go pear shaped!” I said. Pears being so good, it seems odd to me that pear salads go in and out of style. This would be really delicious. Hi Mae, it really is a tasty salad! And it IS curious that pears (at least in salads) aren't used more often. Thanks for the comment. mmm...I am drooling over those blue cheese bites. Love the pairing of pears and and blue cheese. A fantastic salad, John. Hi Angie, blue cheese and pears are dynamite together! :-) Thanks for the comment. I am a huge fan of fennel, especially in salads. I never would have thought to pair with pair (yeah I write that). And blue cheese to boot. Looks amazing. Hi Evelyne, this salad is a wonderful pairing of flavors. :-) Thanks for the comment. Oh, this is indeed fancy!! love the flavor combination. Hi Amira, its flavor certainly is pretty fancy. :-) Thanks for the comment. Beautiful. I honestly wouldn't use balsamic vinegar on this gorgeous salad because it would ruin the look of it! I'm in the South of France right now and bought both from the market today - now I know what we will have for dinner! I've been enjoying your blog since 2013, not always having the time to comment, but I read it on regular basis. Thank you so much for all inspirational ideas! This looks very refreshing. Although we haven't had much of a winter, I am ready for spring to spring!! This looks like a great way to get started on that. Hi Mimi, it DOES ruin the look of it -- this photo is with champagne vinegar for that reason. But the flavor is excellent with balsamic. Thanks for the comment. Hi La Torontoise, I'd love to be in the south of France rightr now! Mrs KR could practice her French -- her speaking skills are rusty, but your reading/writing ability is excellent. Always glad to see you comment. :-) Speaking of which, thanks for the comment! Hi Ansh, our winter has been unusually cold, so we're totally ready for spring! Thanks for the comment. If you’ve ever been to Graziers they have a wonderful fennel and bleu cheese salad I love. Yours looks perfect and those hunks of cheese are beautiful! Hi Vicki, haven't been there! Sounds like we need to check it out. :-) Thanks for the comment. What an elegant salad, John! Love pears. Love finocchio. Love blue cheese. Love the dressing! We once bought a ceramic jar that was for finocchio seeds. It looked like it said Pinocchio, though. The guy at the (U.S.) shop was laughing at us for buying it! Hi David, that sounds like a fun jar! :-) Thanks for the comment. Love fennel but have lacked the imagination to pair it with pears and blue cheese - oh, that will be remedied vey fast :) ! I can see that being the most important part of the meal ! It being autumn here Bartlett and Bosc pears truly are in their prime . . .
Mmmmm....love this combo! I've always loved raw fennel in a salad, so cannot wait to give this one a try. Hi Eha, your pears should be at peak ripeness soon, if they're not already! Enjoy. :-) Thanks for the comment. Hi Liz, raw fennel is great, isn't it? Love its flavor! Thanks for the comment. Fennel is so under appreciated but it is so good. It goes well with pear, terrific salad! Hi Dahn, love the fennel/pear pair. :-) Thanks for the comment. What a simple and delicious little salad. I make an apple and fennel salad but I think I would enjoy yours better. Love the simple vinaigrette and especially the blue cheese. Thanks for sharing John! What a gorgeous salad! Pear is so classy. I would definitely add the walnuts. Hi MJ, apple and fennel is pretty good too! :-) Thanks for the comment. Hi Jeff, walnuts go really well with pears -- good choice to add them. :-) Thanks for the comment. John, this is a fantastic salad! So elegant! Really loving the combination of flavors. I love everything about this simple salad! Fennel is such a surprising add-in for taking salads to a new level. So good! 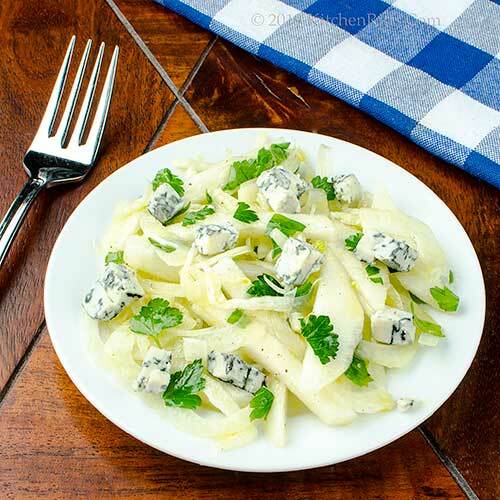 Love the sweetness of the pears, anise flavor of the fennel, sharpness of the blue cheese together. Fun in every bite and fast. Yes please, I'd love a nice plate of your salad...I love every single ingredient in it. Well done. Hi Sherry blue cheese is wonderful with pears. And fennel. :-) Thanks for the comment. Hi Kelly, isn't this a neat salad? And so simple! Works for us. :-) Thanks for the comment. Hi Natalia, it IS delicious! :-) Thanks for the comment. Hi Judy, we used to almost never use fennel for some reason, but now use it all the time. Love it! Thanks for the comment. Hi Bobbi, yup, fun in every bite! It's good stuff. :-) Thanks for the comment. Hi Karen, isn't this nice? SO tasty! Thanks for the comment. Oh pears! Such an under-rated fruit that is just so dang delicious! Wow. I miss those babies! How interesting to pair it with fennel! Hi GiGi, pears and fennel really work well as a pair. :-) Thanks for the comment. Blue cheese on mine! What a fabulous way to salad! The presentation just screams spring. Hi Deb, yup, spring is springing. :-) Thanks for the comment. 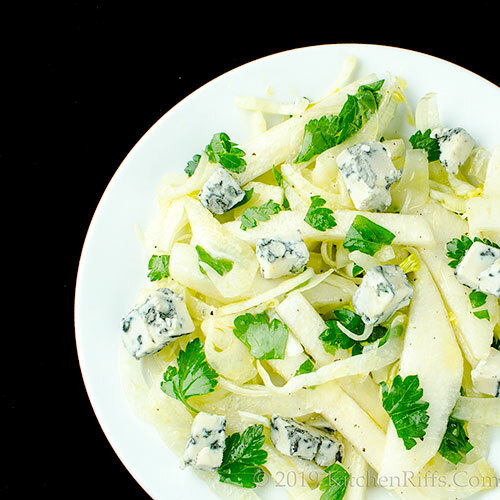 Fennel is my favorite for a spring salad, always with blue cheese! What a beautiful "entrance to spring" salad. So bright, light and lovely. I don't use fennel nearly enough. This is reminding me how much I like it, and with the blue cheese - oh my! Hi Anne, fennel is a good friend, isn't it? :-) Thanks for the comment. Hi Valentina, up until a few years ago we almost never used fennel for some reason. Now, we use it all the time -- such good stuff! Thanks for the comment. Fennel, pear and blue cheese, how could this be bad? Sound wonderful John and a dish we must try. Thanks for sharing. 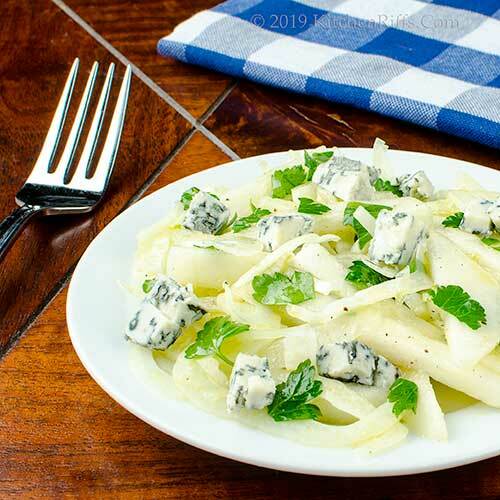 Fennel salad...I sure remember it...and yes, I love even more this version with pear...sounds fantastic John! Hi Ron, it's pretty good. :-) Thanks for the comment. Hi Juliana, fennel salad is so good, isn't it? Love fennel in a salad! Thanks for the comment. 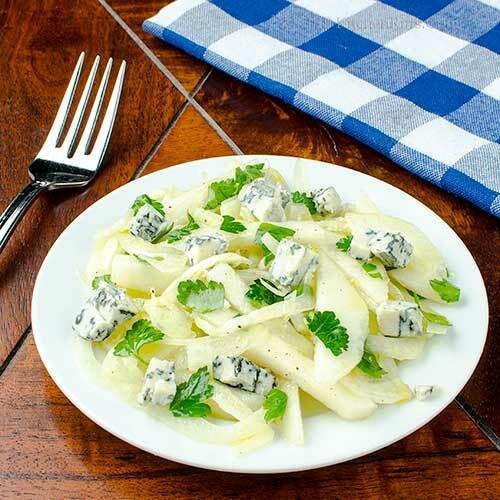 Yep- fennel, pear and blue cheese sound like a winning combo! I always thought the French word 'fenouil' sounds a bit funny- rhymes with 'katooey'- oh, well! Hi Fran, fun observation re katooey! And yes, this is a winning combo. :-) Thanks for the comment. It looks delicious and my family would love it, but I'm not so fond of pears. Blue cheese works all the time though. Have a good weekend! Hi Rocquie, enjoy! :-) Thanks for the comment. Hi Pam, apples would make a good substitute for the pears. :-) Thanks for the comment. Simple sides like this are just the best! Roquefort is my favorite bleu cheese and it would be great in this. Hi Laura, Roquefort would be excellent in this! :-) Thanks for the comment. Ah those are all my favorite flavours combined into one John. Looks totally delicious! Hi Simone, aren't the flavors in this fun? Love this salad! Thanks for the comment. Hi Taruna, you could skip the cheese, or replace with walnuts. And agree fennel and pear are a big yay! Thanks for the comment. Raw in salads is my fave way to enjoy fennel. And the cheese and pears just make it even better! Hi Carolyn, raw fennel is terrific! We love it in salads, too. :-) Thanks for the comment. Hi Anne, nice, huh? :-) Thanks for the comment. It looks beautiful and delicious - loves those big chunks of blue cheese. Hi Pam, who can resist chunks of blue cheese? :-) Thanks for the comment. Such an easy and refreshing salad. Hi Denise, isn't this nice? Wonderful flavor! Thanks for the comment. This salad has such a lovely combination of flavors! I love the pear and fennel together. Hi Amy, this is such a neat salad -- we love the flavor of it. :-) Thanks for the comment.